Amiga Pd are very excited to present an interview with Andreas Seebeck who was involved in writing some great commercial games for the Amiga including Tennis Cup and Aunt Artic Adventure. Unfortunately the legal ownership of the games is unclear and therefore we cannot make the games available for download and will not answer questions about where you can find disk images of them. 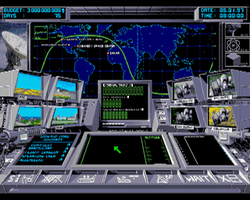 The majority of the games were published on Amiga ClassiX 2 by Epic Interactive and this disk collection often appears on ebay. How did you first become involved in writing games? Was the Amiga the first computer you programmed on - or were you involved in the 8-bit machines too? I was sixteen years old when I bought my first computer – a C64 with a tape-recorder. I instantly became addicted to software development. My first game was a space invader like game written in basic, but C64-basic was awful to tame when the code grew bigger, so I switched to machine language to make things faster. On C64 that was a pain too, because every command had to be translated to byte codes by hand and then be poked into the memory. 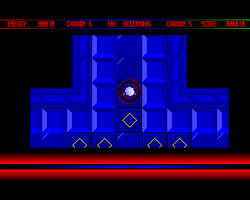 You state Charon V was inspired by C64 game Paradroids - was this a game you personally enjoyed playing and were keen to port over to the Amiga or did other people make decisions about what games to make? My favorite games on C64 were Hunchback, Paradroids, Gridder and Impossible Mission. Me and my friends spent nights playing these games. When the Amiga came out we were all excited that the games would become even better due to all those fantastic gfx and sound features. Unfortunately the reality was we were slightly disappointed because whilst the games were better looking they were often worse to play during the Amiga's early life. Controlling the main character was often blurry. I think, that was the reason why I found myself learning machine language, blitter, copper and co. It was to make a paradroid like game by myself. Well, the gameplay came out completely different than paradroid, but I think did a good job in letting the player precisely control the robot. On your website Thomas Seebeck is listed as providing the graphics and sound. Was this game a family produced game writen in the bedroom programer tradition or did you have a contract with a compay to write the game? It was completely done after school in my room, fantasizing that “Rings” would become the most famous game on the Amiga. Poor me. At least it was very adventurous to visit all those early game companies like Rainbow Arts to show them the game. Finally a friend of mine, Amiga intro programmer Martin Krause met a group of people at an exhibition, planning to co-publish games with the Canadian company Mindware Int. One of them Markus Scheer, later went on to become one of the heads of Starbyte Software and, when Starbyte had gone, became involved with Phenomedia. I improved my English very much conferencing hours with Mindware by phone. And it was them who forced me to rename “Rings”, and so I decided to change it to “Charon 5”, inspired by a science fiction novel I was reading that time. 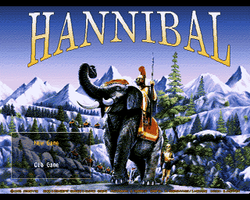 Did Thomas Seebeck help out on other games you worked on? Yes, e.g. he helped me designing all those levels in Aunt Arctic Adventure. Were there any particular difficulties you experienced when making Charon V? Oh, there were difficulties everywhere. I did not use any operating system function; maybe I even did not know that I could. So I developed everything from scratch, e.g. inventing an own formatting of the floppy disc, accessing the floppy controller chips directly to write and read data. It took me weeks to make this working, but I liked it to access all this hardware directly. Almost unbelievable now in a time where we have hardware abstracting operating systems like Windows. In the magazine reviews of Aunt Artic Adventure, comparisions were made to the C64 game Montezuma's Revenge - was this a game you took inspiration from? No, I never played it. It was inspired by hunchback. Hey, had a great time just now when I found a video of it on youtube. The one criticism of Aunt Artic Adventure is that the fifty levels lacked variety - was this issue discussed during development? 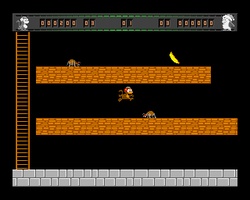 And the background to the levels are mainly black - were there any discussions about adding extra background graphics or was this to keep the style similar to the C64 platform games? The main aim for AAA was to create a game where which responded to the players fast reactions. Moves and jumps had to be carried out very precisely, more automatically as reflex than as forebrain action. Today I know that the fun I had by playing hunchback was because it induced the state called “flow” (see wiki: flow), and my intention was to do something similar in AAA. Well I think I succeeded in doing so, and variety the kind of the game testers / reviewers meant was never intended. I‘ve been very surprised (and disappointed), when it came out that those testers / reviewers did not like the game because it had no backgrounds. In my opinion it was the best game of its kind at that time, but well, the testers wanted to see another kind of game. 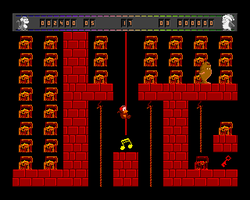 Regarding the variety in the 50 levels: you would not believe how hard it is to create 50 different levels – but with the help of my brother we managed it. I do not know what kind of variety the critics wanted , I think the levels variation is great, and much bigger than in hunchback btw. Screenshots are taken from Lemon Amiga website. 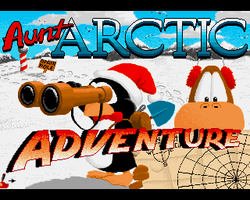 On your website you state that Aunt Artic Adventure was a fun game to play and work on, what made it such a fun game to make and be involved with? Fun to play because you had to focus on the game totally to be successful - which is inducing that flow state I mentioned above. Quite different to today’s casual games where many watch tv and using their mobile simultaneously while playing a game. Fun to make: I’ve been very proud to have such brilliant graphic artists working with me like those 2 kids from USA, Michael and Jeremiah O´Flaherty. Can’t believe that we got this to work without internet, just by phone (which was expensive) or by mail (every picture needed about 2 weeks to come from USA to Germany). I liked those guys very much, and when I went to USA with my family for holiday (remember I was still a teenager that time), we visited them on Christmas Eve. They lived near to Dallas in a big family, having 10 siblings, and it was the most impressive and heart-warming Christmas I remember. I was shocked when I heard that Michael died due to unsuccessful heart transplantation some years later. To work with Thomas Völker was great too. He made a soundtrack I still like to listen to from time to time. Unfortunately I’ve lost contact with him, so Thomas, if you read this, get in touch with me! Why was Tie break made with an overhead perspective? Was this to be different to other tennis games at the time which were mainly played from behind the tennis player? After AAA had been published, it was the time when tennis games became very popular. It was also the time when I finished university as graduate engineering and started working at Starbyte Software in Bochum, and Markus asked me to develop a tennis game. 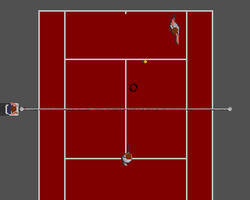 I did not like tennis games due to the manner of how the player had to be controlled, I was not even interested in tennis at all, so I started Tiebreak with the agreement I could develop my own user interface, which was the only thing I was interested in, besides programming the physics of a tennis ball perhaps. I wanted the player to be able to precisely control the direction of the ball by the angle of the rack hitting the ball, and that was possible with an overhead perspective only. 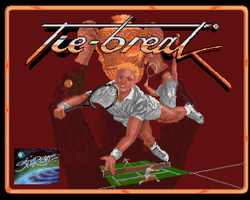 Did you know at the time that Tie Break would be your last Amiga game? At the beginning? No, not at all. At that time PCs did not even have color – or maybe 16 colors on very expensive systems. The idea of developing an Amiga-quality game on a PC was ridiculous. After Tiebreak was done (which took about a year), things looked different. 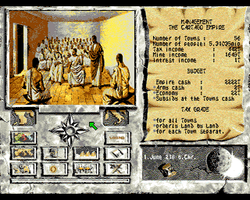 PCs were able to display graphics instead of text only. But although I was used to PC programming (my diploma was a user interface for a medical instrument, developed with Turbo Pascal on a PC), developing games for PCs was a torture those days, because I had to cope with all those about 20 different graphic adapters available on the marked, and writing routines for each of them. Almost the same with sound, but fortunately there weren’t many different ones available. The Amiga was always the Amiga, a certain device, in contrast to the PC world, where speed and hardware devices were totally undefined. A situation which took me often thinking longingly back to the Amiga days. Tie Break was converted to the CDTV - was there much excitement about the CDTV during the conversion? The CDTV seemed to be viewed at first as the next big market. I think, that was the reason for the conversion. We spent about a year for this conversion, with much work and much hope. 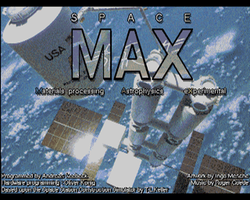 I was working on a pinball game for Amiga and CDTV when Commodore got problems and we were forced to switch to PC games and to another kind of games like Space M.A.X. or Hannibal. On the Hall of Light Amiga database they list Adidas Championship Tie Break - was this any different to the other versions of Tie - Break - What is the reason behind it being shown as extremely rare? Well, the only interesting thing I can say about that, is that I never heard of it. Or maybe I do not remember. But I’m sure I developed only one Tiebreak, so it cannot be different to the other versions besides another splash screen maybe. Which of your Amiga games are you most proud of and why? Aunt Arctic. Graphics, Sounds, music, gameplay, all those different mooded levels – it’s a game as I wanted it to be. I like it 100% and cannot find a thing I would change. I even programmed a clone for the PC, including a level editor, but it never left my office because it appeared to me that I am the biggest and almost only fan of my game. Is there anything you miss from the Amiga period of the game industry? I cannot see too many changes in the industry since the Amiga days besides in quantity. The only one who changed is me. In those early days I had lots of fears, afraid of someone could steal my game, my ideas, have the same idea but is faster at completing it than me, people hacking my game, that the game does not work on other computers, that it would not be successful or the company going bankrupt etc. Looking back I find most of those fears unnecessary, and I could have had a much better time without them, as I have it now. Were there any particular amuzing or bizzare incidents you remember from your time programming on the Amiga? Oh, lots of them. I keep telling about the way how we burnt a CD-Rom in CDTV days: With a big box of floppy discs I had to fly to England, rent a car to drive from London to Campridge where a company possessed one of the first CD-Burner in the world. That burner filled a room which was secured like something of the X-Files. Or about that young graphic artist who’s life was drawing and just drawing, he would draw day and night without breaks. We used to find him, when we entered the office in the morning, sleeping with the mouse in his hand and his head lying on the keyboard. From time to time we had to push him dressed under the shower, when he began to smell too strong over the weeks (sorry, I’m exaggerating, that happened only once). Well, he was a teen and lived alone, so can he be blamed? What a kind and brilliant artist, we liked him very much. I met so many strange personalities in the game scene, it was astounding. And I fit well into it, I have to admit, that I had my quirks too. The majority of your Amiga games were released on Amiga ClassiX 2 at Epic Interactive - did this involve any royalties for the games? And what is the legal situation of your Amiga Games - can they be downloaded to play from the internet or does a particular company still hold the copyright preventing their distribution? Good question. I really don’t know. None of the companies exist anymore, and I heard of a law that gives the right back to the author after a period of years in which the work haven’t been sold. So I might be the holder, but I’m not sure. And no, I did not want any royalties. Were you ever involved with setting up a publishing house during your time working on the Amiga or were you employed as a programmer during this time? After starting as a hobby programmer I became an employee at Starbyte, and stayed there over the whole time of its existence, which was about 4 years. From your website it seems that after the amiga you produced games for the Swiss Federal Office Of Public Health - how did this come about? That story starts with a bug in ‘Rings of Medusa’. Because of this bug a customer from Switzerland got in touch with Starbyte in order to get a fixed version. Now this man happened to be the most famous author of novels and screenplays in his country, Claude Cueni, and it ended up with the project “Hannibal”, with him as director, Ingo Mesche as graphic artist and me as software developer. We had much fun working on that great project while we became good friends, and after Starbyte Ingo and me developed games for the swiss television at Claudes Company Black Pencil Games as freelancer. In the meantime in Germany Markus Sheer founded, together with some other guys, Phenomedia, which got very famous and successful by a game called ‘Moorhuhn’, which based on a character developed by Ingo too. In the age of the new economy Phenomedia bought Black Pencil Games which was renamed to Phenomedia Switzerland. Now besides working for tv we were developing download games like Moorhuhn, and as a swiss company most of them for the big swiss institution “Swiss Federal Office Of Public Health”. What a time! Are you still invovled in making games - if so what are you currently working on? I always have been interested in meditating and altered states of mind. I am practicing Taiji and Qigong and became a Qigong teacher while I developed games. When I got more time for these things due to the new economic crash, I went into chinese medicine more deeply and found that my abilities to focus very closely in a certain kind of manner is making me a very good healer. With an effective method called MET (similar to EFT) I got almost a bit famous in Germany as a healer of phobia and OCD and even proved my abilities on TV. Then, after working as a fulltime healer for about a year, I began to miss that game developing - just when my old friend Ingo founded a game development company in Malta and asked me if I would like to join. While I’m still doing my healing work and seminars in mindfulness (together with my brother Thomas, who became a very successful osteopathic healer btw. ), I’m developing games again, now with AV Technologies Inc.
We have just finished a game called “Them – The Summoning” which comes out in about a month. There’s a preview on youtube, have a look at it, it’s great. I have always been very impressed by Ingo’s Artwork. I am very lucky about how everything worked out in my life – about my work as game developer, healer and teacher, but most of all about my wife and my 2 children. No game can be more interesting, fascinating or exciting than living the real life, especially the family life. Don’t you agree? 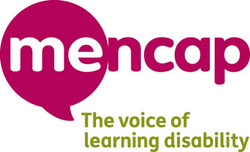 AmigaPd would like to thank Andreas Seebeck for his time and support with creating this page. Remember to visit his current website to see his current projects.